My iPod is always on shuffle and these last couple of weeks I’ve been getting plenty of 80’s tunes popping up. Mr. 12 hates it because I am much more likely to start singing (or wailing!). Anyway, Monday was Mayday Eve and while I was preparing potato salad, this came along. Talking Heads on that Road to Nowhere. Mayday has its own word in Finnish: Vappu and a great many traditions also. Earlier it was a day of celebration for workers and in more recent times, students have turned it into a day of revelry. Actually, the most action seems to take place on the eve of Mayday, when statues around Finland are ‘crowned’ with white cap that students receive once they have successfully matriculated. If you are game, do a Google picture search using key words Vappu and Helsinki! There are some dishes that are also traditionally served at this time: sima, which is an home-brewed soft drink, similar to ginger beer, very low in alcohol so children are able to partake also. The first year I brewed sima I was a little heavy with the yeast and we had exploding sima! One year I made munkki also, and although they looked and tasted great, the house smelt like deep-fried food for days afterwards. Once was enough to prove that I could do it. Potato salad and nakki (frankfurters) are also traditional Mayday fare. My potato salad comes from this fantastic book, based on the TV show of the same name. 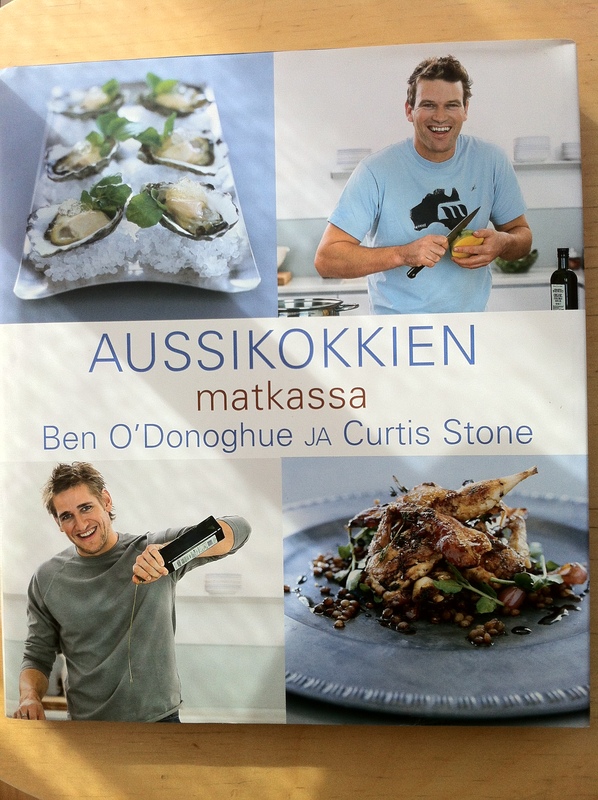 (In English it’s called Surfing the Menu, by Ben O’Donoghue and Curtis Stone.) If it comes to a small screen near you, take the opportunity to watch an episode or two. Good looking chefs, great scenery and yummy food, what more do you need? Great pic of the Finnish(ed) product (hahahahhaha) (sorry). 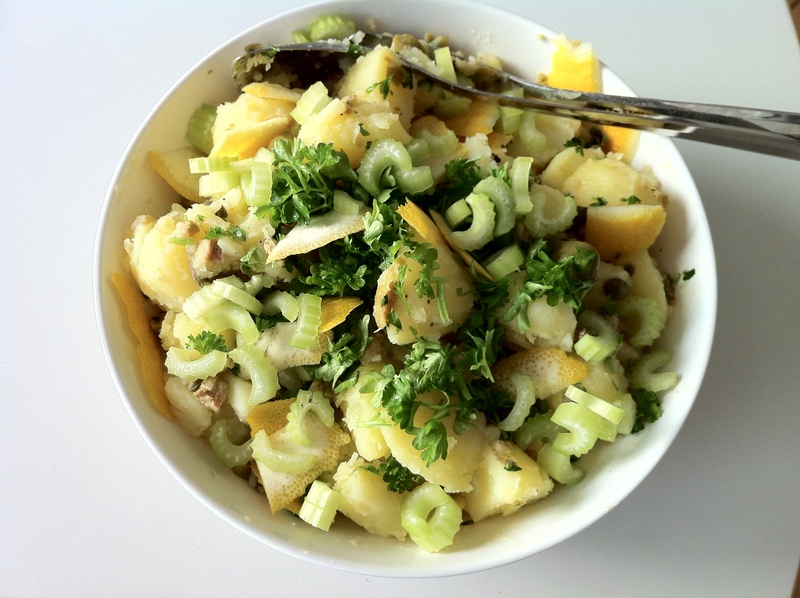 Good potato salad is nice because it’s simple and can be really really good! I would be disappointed if that word play wasn’t used at least once a day, somewhere, anywhere!